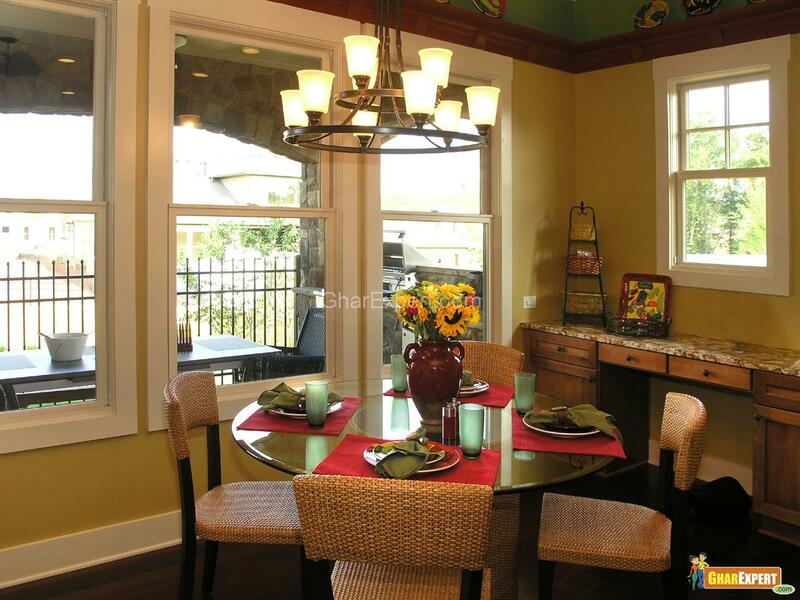 Small rounded glass dining table look pleasant when you place wooden cane chairs in front of them. Now cane furniture is using frequently in every room of your home. Simply furnished cane chairs with comfortable back sound different and interesting. Easy cleanable and durability are some of the advantages of the cane chairs. You can also use a cane basket as a side table in this small dining. Fix sliding mirrors on the doors of the wardrobe in the bedroom. Full sized mirrors look interesting and give the illusion of spacious bedroom. They will give you a lot of storage space behind the mirrors where you can store your casual and party wear clothes and various other accessories also. Wooden toddler bed with gorgeous bedding looks appealing in this toddler’s bedroom. You can enhance the beauty of the toddler bed with a dashing canopy which hangs from the circular wooden supports. Try to match the color of the canopy with the other furnishings of the room. For entertaining your sweet baby, hang toys over crib. It will give a pleasing environment to your baby within his room. You can hang a toy bag at the front side of the crib to store different toys of your baby. This toy bag makes the toys organized and creates a clutter free atmosphere in the baby’s room. Fix three steel hooks in a series near bathroom vanity cabinets to hang the towels. With this arrangement, you can easily find the towel after getting fresh. Try to install the hooks at easy accessible heights so that everyone would get the towel easily. Install decorative lights on the wall of the dining room to make it the focal point of the room. Rays of decorative light do not fall directly on the dining table but they create a magical look in the room and grab everybody’s attention while entering in the room. Stunning decorative lights create a wonderful atmosphere for a romantic dinner. In the corner of a bedroom, you can place a traditional wooden rack. This wooden rack allows you to keep the different accessories such as alarm clock, jewelry box, family photographs, decorative art pieces and stylish flower vases. You can place your mobile phones or any important diary on the rack in order to make them safe from your little naughty kids. Colorful glass tiles look fantastic on the wall of the bathroom. Vibrant and dashing colors of tiles give life to the boring bathroom wall. A large flower painting adds more sensation to the bathroom while you are going to take bath. Appealing upholstered bar stools create a magical look in the bar area. Soft leather used in the bar stools offers an elegant look to your interior. Various colors of barstools make the bar area the center of attraction. To enhance the look of your room, you can place a large plant container in a corner of the room. Keep some decorated twigs in the container. Try to match the color of the plant container with your sofa and the other furnishings. It will look quite interesting in your drawing room or living room. Decorative metal wall sconces offer a nice look to your bathroom. You can place soap dish, lotion, shampoo or anything of your choice on it. It is better to use wall sconces in such bathrooms where there is lack of space.